It’s finally springtime! Which means flowers! Sunshine! And Spring cleaning? But spring cleaning doesn’t have to be a hastle. Let J. Brian Day Emergency Services take care of all your carpet cleaning. With their reliable and responsive technicians, they will thoroughly inspect your carpet, identifying any stains or odors. Then they will not only take the necessary steps for removal, but also implement a plan to preserve and protect your carpet for years to come. J. Brian Day’s best interest is in their customers and creating a cleaner and healthier home environment. Proper cleaning of carpets helps remove dust, allergens, pollen, and pet and insect dander that could be hiding in the fibres of your carpet. By eliminating these elements, you’re not only cleaning your carpet, but you’re also cleaning the air within your household. It’s allergy season, so there’s no better time to get rid of that dust and dander that builds up in your carpet! Carpets act like filters and trap allergens. If the carpet is not cleaned correctly, the allergens can be disturbed and released into the air again. 90% of house dust is made up of our own skin that we shed every 3 days (a regular food supply for the dust mites and bacteria that breed in our carpets). Even if your carpet looks clean, dust and bacteria can still be settled between the fibres. Microscopic bacteria and germs can hide away in your carpet. When you have your carpets professionally cleaned, these systems penetrate deep into the fibres and lift out the dirt and many pollutants that we track into the house. These systems then bring the pollutants out of the household and dispose of them in the correct manner. By having your carpet professionally cleaned, it will remove most of the moisture, allowing carpets to dry fast and prevent mold growth. When a carpet is kept clean and dry, mold simply cannot grow on synthetic fibers. Who doesn’t want their carpet to look brand new? Dirt particles hidden within the carpet act like sandpaper, breaking down the carpet fibres every time you walk on it. Eliminating the dirt particles will eliminate the breaking down of the carpet fibres, making them look clean and new. Does your carpet have stubborn stains that just won’t come out? 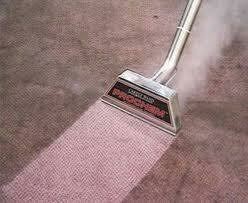 By having your carpets steam cleaned, it uses a hot water extraction method to get rid of those unwanted stains. Your carpets cost you a lot of money, so why not keep them in prime condition? Dust and dirt particles have sharp edges that can cut carpet fibres, leaving them looking frayed and lifeless. Have your carpets professionally cleaned to prevent this type of damage and extend your carpet’s life.